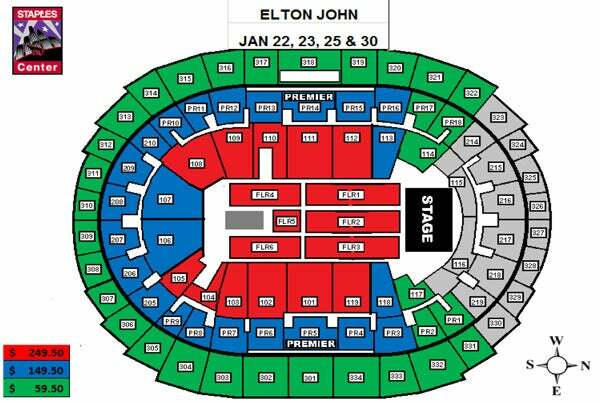 Elton John will hit the stage promptly at 8:00 p.m. with no opening act. We strongly advise arriving early so you can be in your seats by 8:00 p.m.
After more than half a century on the road and an unparalleled career that has redefined the cultural landscape and seen Elton John claim his place as a true global icon, the superstar has announced via an exclusive VR180 live stream on YouTube, details of his final tour called ‘Farewell Yellow Brick Road’. Kicking off in the U.S. on September 8, 2018, the ‘Farewell Yellow Brick Road’ tour will consist of more than 300 shows across five continents, hitting North America, Europe, Asia, South America and Australasia before reaching its conclusion in 2021. He will make a stop at STAPLES Center in Los Angeles on January 22, 23, 25 & 30, 2019. These dates mark the superstar’s last-ever tour, the end of half a century on the road for one of pop culture’s most enduring performers. Elton’s new stage production will take his fans on a musical and highly visual journey spanning a 50-year career of hits like no one has ever seen before.